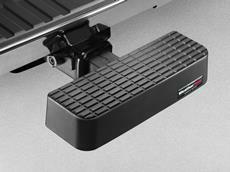 WeatherTech Billet BumpStepXL is our largest BumpStep, and is made of heavy-duty solid billet aluminum. 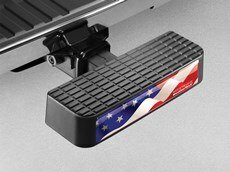 This trailer hitch mounted bumper protection is handcrafted in America, and defends your vehicle's bumper from rear end accidents, dents and scratches. Designed to fit any vehicle with a standard 2" receiver hitch. It’s HEAVY! It’s HANDMADE in America! It’s made from SOLID billet aluminum, and it’s now available in the XL 24” wide size! It’s COOLER than the original design, and it’s the best step-bumper protector you can buy. We make the Billet BumpStepXL in our tooling facility in Downers Grove, IL by American Machinists on American made CNC machines. We machine this version in two pieces to add features and custom styling. Made in very limited quantities, we start with a 53.1 pound solid aluminum billet for the step, and a 5.98 pound solid aluminum billet for the post. Many hours are then spent sculpting the Billet BumpStepXL components in multiple CNC machines. Special cut-outs with collision webs are engineered into the bottom of the step to help us lighten it up. The two pieces are machined to a precision fit, assembled using exacting standards, and support USA made 304 stainless hardware. Custom fixtures had to be made, programs written and more specialized cutters purchased, all to make our newest, and worlds best bumper protector/step. The aluminum is hard-anodized for corrosion resistance and scratch protection. Super strong rattle free installation utilizing a 5/8” install stainless steel hardware with a theft deterrent Allen Key bolt to help prevent theft of your Billet BumpStepXL. 1/2" Allen Key is required to fasten. 24” wide and 3.5” tall, with an extra-deep 4 ¼” step depth. Why Get a Billet BumpStepXL? Because it’s badass! Kidding aside, it’s the best protection against bumps, dents and scratches to your vehicle’s bumper. Careless drivers can bump, knock and crash with little or no concern for your vehicle and it’s back bumper. With the Billet BumpStepXL, you have 24” of reassurance of bumper protection from other motorist’s mistakes and small accidents from backing up. As a vehicle owner that takes pride in your investment, scratches and dents to your bumper are as much of an eyesore as a ding to your door. 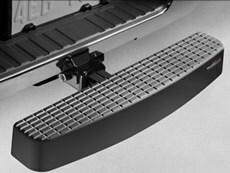 Billet BumpStepXL helps prevent having to get your bumper repaired. 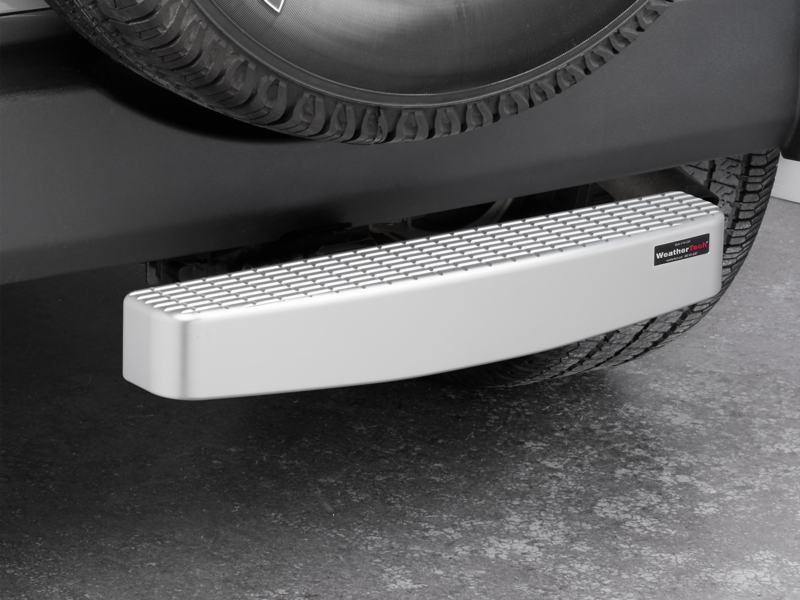 As the "step" portion of its name describes, Billet BumpStepXL gives you twice the area to safely stand on for everyday tasks such as loading a roof rack, racking a bike or kayak or washing the upper area of your vehicle. The Billet BumpStepXL has a higher weight rating than the tongue weight capacity of your vehicle's receiver hitch! Insert the Billet BumpStepXL into the 2" receiver hitch on your vehicle at the most desirable position. Then install the hardware and securely tighten the bolt. 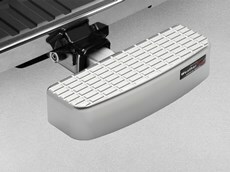 The secure mounting design holds the Billet BumpStepXL firmly inside the receiver to reduce flexing and movement. There are four possible mounting positions to allow for proper installation depth on virtually all receivers. Note: If your BumpStep has been involved in an impact or accident it is important to have it inspected for cracks or fractures prior to placing any weight or loads upon it. Please send it to WeatherTech, BumpStep Inspection, 1 MacNeil Court, Bolingbrook, IL 60440 and we will be happy to inspect it and advise you if it needs to be replaced.